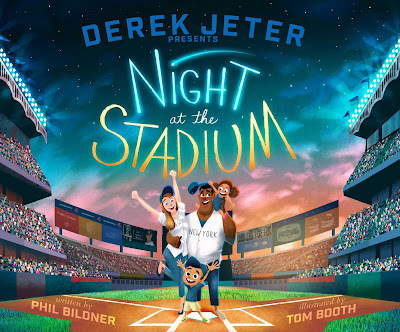 Today we feature talented author-illustrator, Tom Booth to the KidLit411 Spotlight! 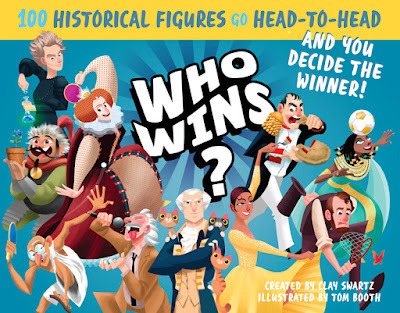 Be sure to enter the giveaway to win a copy of his new book, WHO WINS?, by Clay Swartz in the rafflecopter! Tell us about how you came to illustrate for children. My parents have always told me that when I was little I used to draw characters walking off the page. So, I like to think that I have always been interested in images that tell a story. I gravitated towards children’s books because I love how words and stories can be combined to tell stories that inspire strong emotions and stick with us, sometimes for the rest of our lives. Congrats on your recent book, WHO WINS? Tell us about it. How did you research all the characters? I was actually a history major in college, so I was somewhat familiar with some of the characters in the list Clay and the fantastic team at Workman Publishing put together. That said, there were plenty of influential people who I had never heard of, so I had to do a lot of research, which proved to be incredibly inspiring. For example, I was completely unaware of the story of Ernest Shackleton’s Imperial Trans-Antarctic Expedition, otherwise known as the Endurance Expedition. What an amazing story! WHO WINS? has an unusual format. Were you involved in the design of it? I wasn’t involved in the design of the book’s format, but I have to say I am thrilled with how it turned out. 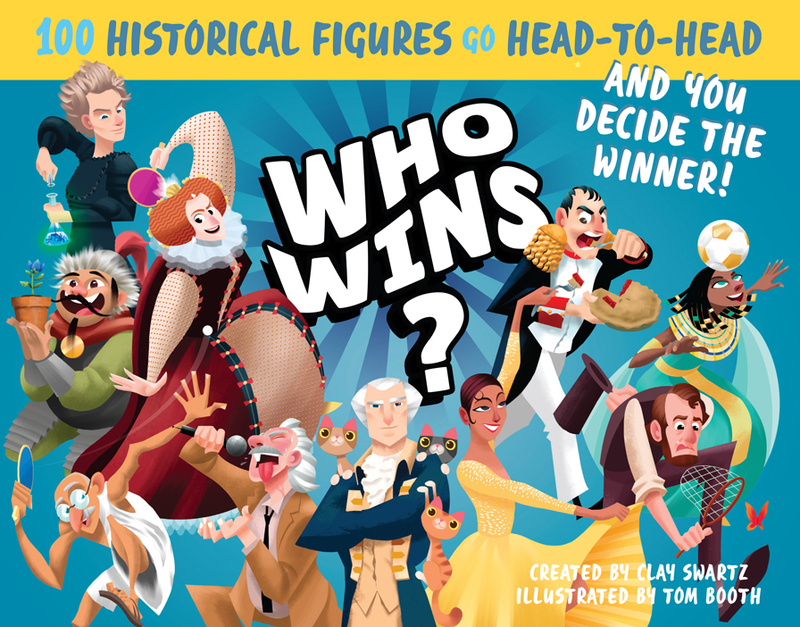 As soon as you hand the book to someone they start flipping through to discover who made the list, and to pick two historical figures who would make for a good match. It’s incredibly engaging, and I hope it’s not the last time I see a book take advantage of this approach. I’m happy to say I have a book coming out in 2017 with Feiwel & Friends at Macmillan, which will be the first book I’ve authored and illustrated. 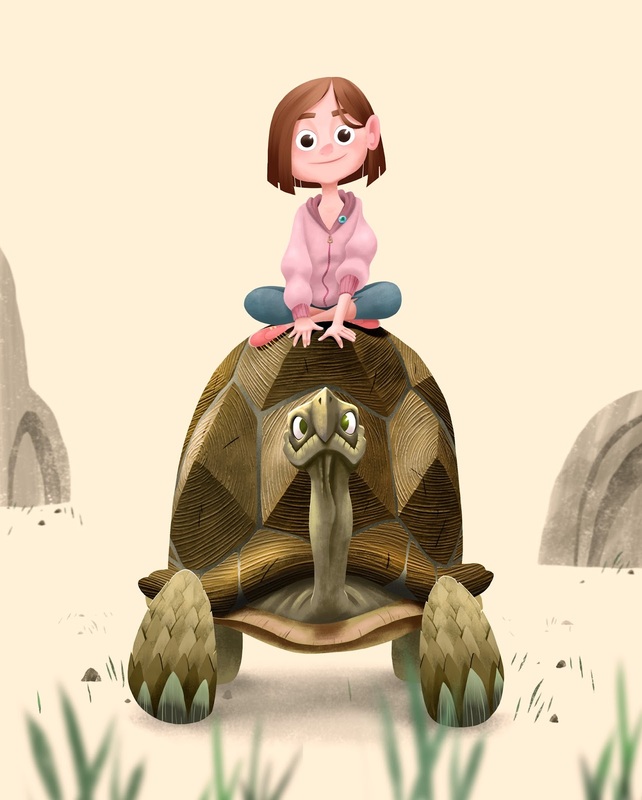 I can’t wait for readers to meet my cast of characters, especially the little girl and the tortoise who will be featured on the book’s cover. If all goes well, you may be seeing more of them! What is the hardest part about illustrating picture books? The hardest part is keeping the best ideas under control. When you think of a great idea for a story or an illustration, it’s easy to let your excitement get the better of you to the point where you overthink and overcomplicate the story. Staying true to the heart of an idea is easier said than done. I guess the easiest part is maintaining my enthusiasm for what I do. It’s hard to explain where it comes from, but I can’t seem to wait to tell the next story. A few years ago I promised myself I would draw every day, even if I really wasn’t in the mood. By challenging myself to produce a new illustration every day I’ve found that I can push the quality of my work further. This has helped immensely, especially because I’ve developed a new habit of setting more ambitious goals for myself. The other important lesson has been being grateful for all of the people who have encouraged me along the way. I think a lot of people believe that being an illustrator means sitting alone in a room, hunched over a desk. The truth is that the best stories are developed by many creative people who share the same passion. Don’t worry so much, and don’t overthink everything. For a long time I was convinced I wasn’t good enough to put my work out into the world, and, as a result, I would get in my own way. Even though I still worry and overthink things, I realize now that it’s okay to be a bit scared about sharing something you’ve created with others. If you’re nervous, it’s because you care. Even though I am obsessed with St. Bernards, I actually grew up with dalmatians. At one point we had ten running around the house after our two dogs, Oreo and Pepper, had eight puppies. We ended up keeping one of the puppies, who we named Oliver. 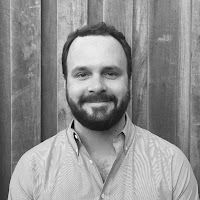 Tom Booth is a character designer and illustrator who has worked in both animation and publishing with the likes of Macmillan, Simon & Schuster, Workman Publishing, Scholastic, and Nicktoons. Tom made his earliest marks — sometimes on his parents' antique kitchen table — growing up in Pennsylvania. Now living in Brooklyn, NY, Tom is currently at work on several picture books on a table all his own. Love your illustration of the St Bernard - so expressive! I sketch daily but now you gave me a new goal: create an illustration every day instead of a sketch. Looks awesome! I think my sons would enjoy it. Great illustrations in this post. Thank you, Christina! I hope your sons enjoy it! 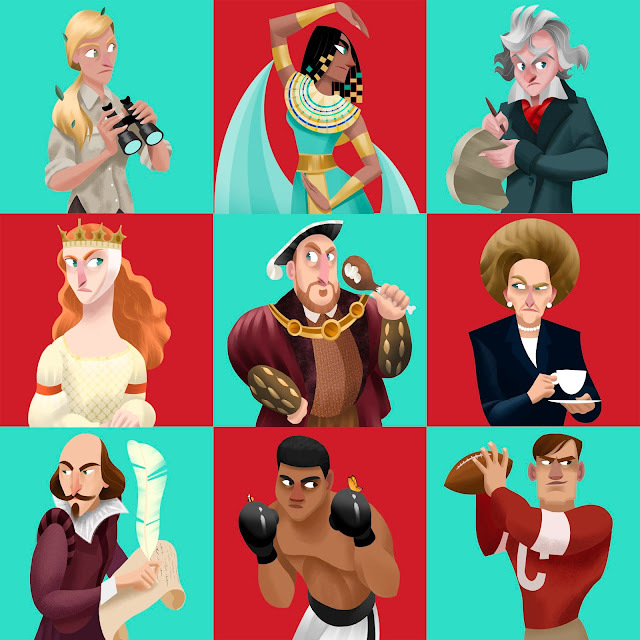 Awesome illustrations! Can't wait for your new book. I love your banana sketch!! I thought it was a funny comparison of how women ask for help zipping up their dress. 😂 Really excited to read this book! I love your enthusiasm for your work--it shows! Your style is so unique and fun. I can't wait to see your work in person now. I'd hang it in my office! 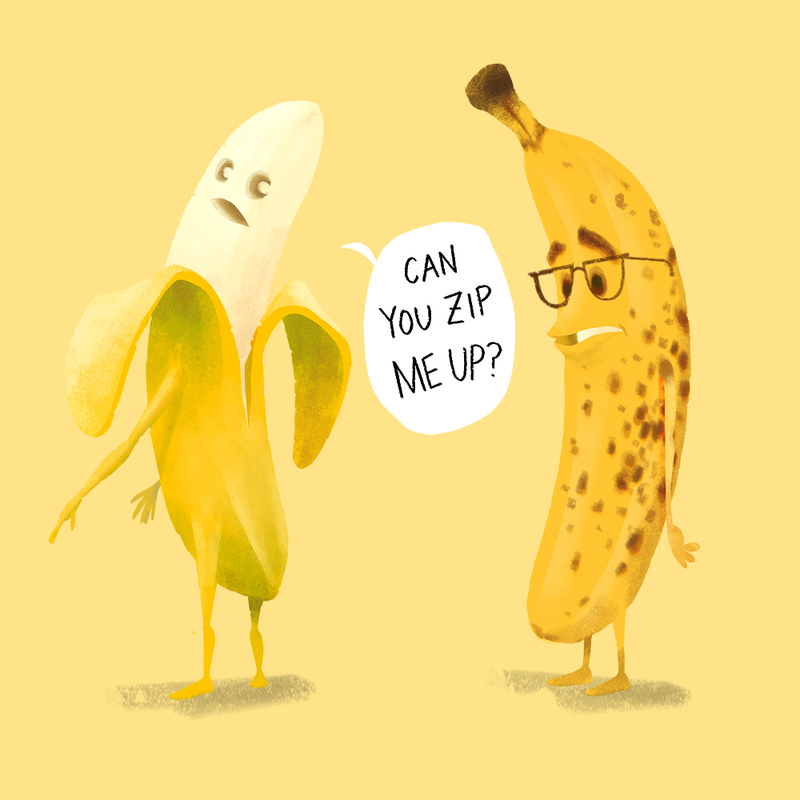 Your illustrations certainly tell their own story! Thank you for sharing your work. Thank you for commenting! I've very happy to see the kind words.